Major Sir William Newenham Montague Orpen (1879-1931) was born in Ireland and enrolled aged 12 at the Dublin Metropolitan School of Art, studying for 6 years before joining the Slade School of Art at UCL from 1897-99. At the Slade he was highly regarded for his technical ability, winning the Slade Composition Prize in 1899. 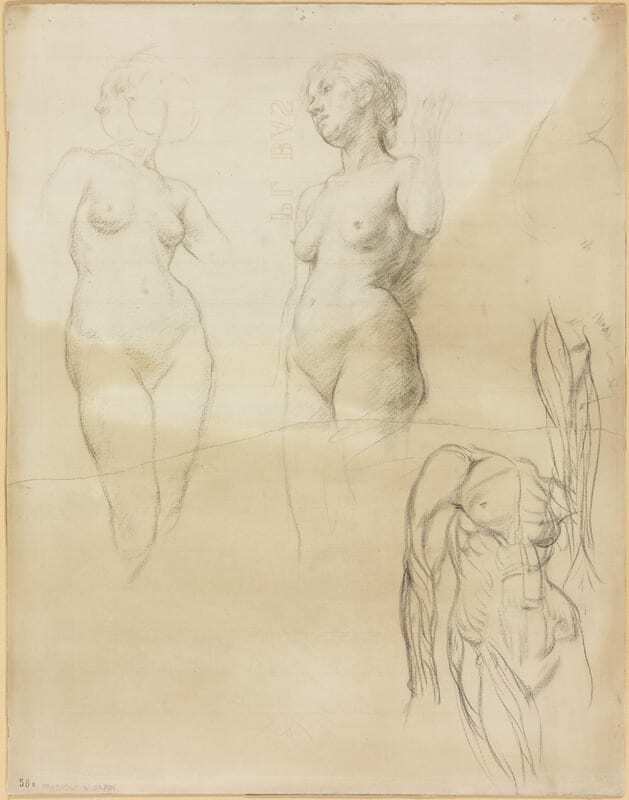 Orpen was taught drawing there by trained surgeon Henry Tonks, my chosen object, a life drawing (LDUCS- 6713) shows the influence of this teaching and emphasis on understanding anatomy, with the inclusion bottom right of an écorché torso- displaying the muscles with the skin removed. In this I see the basis of some of the gaunt figures in Orpen’s WWI pictures featuring exhausted and shell-shocked soldiers. Following Armistice in Nov 1918 he was commissioned to paint the Peace Conference in Paris. 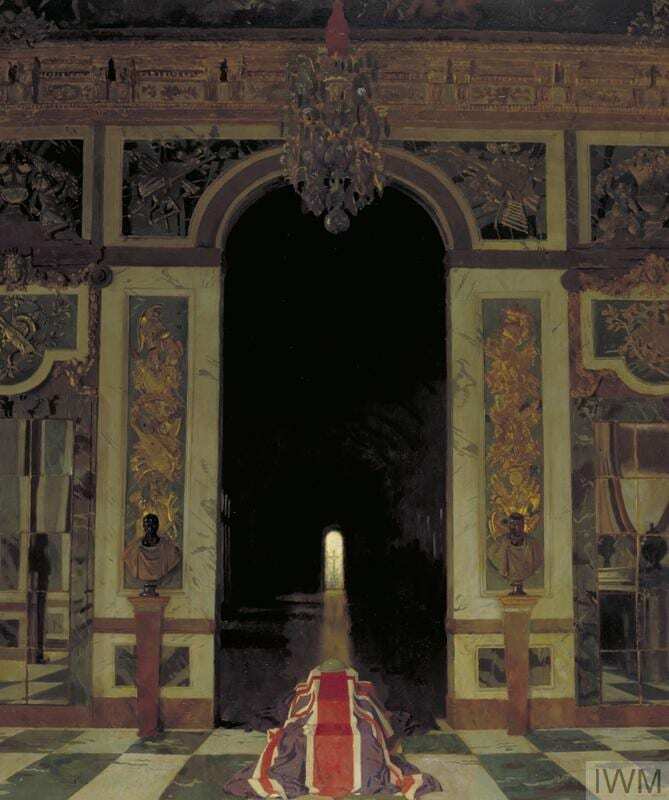 His final work for this (IWM 4438) was rejected by the Imperial War Museum as it depicted a coffin draped in a Union Jack rather than the requested politicians and dignitaries, which Orpen had deliberately painted out adding instead two battle-fatigued Tommies standing guard next to the coffin. In a later twist in 1928 Orpen then painted over the soldiers leaving the work we see today and donated it to the War Museum. The painting was then accepted in this third incarnation. Orpen also gave all his war work of over 150 paintings and drawings to the government for free. His memoir of this time ‘An Onlooker in France’ was published in 1921 with all proceeds being given to war charities. Despite Orpen not being established perhaps as much as other artists for producing some of the most currently recognisable First World War paintings- such as Paul Nash’s The Menin Road or John Singer Sargent’s Gassed, it is this act of protest in paint and gesture and of generosity surrounding his donation of works that captured my attention. Orpen appears a complicated character but I can only respect this choice he made to use his talent and opportunity to voice his and many others feelings on the Great War and those who paid the ultimate price. UCL Art Museum is open Tuesday – Friday 1-5 pm­­­­­­­ The current Exhibition REDRESS, an exhibition and series of public events weaving new life into the Slade’s once prestigious Drapery Drawing Prize will close on 14 December 2018. Lucy Waitt is Curatorial and Collections Assistant at UCL Art Museum.